It comes with a 4GB SD card with a preinstalled Angström Linux. The simplest method to use the console is to connect the board to your PC with the supplied USB cable. It will bring up a serial interface (it should mount the SD card on the PC for the first time but this never worked for me – if it mounts the card for you, just unmount it). Use a terminal (like minicom, gtkterm or RealTerm in a Windows world) with the settings 115200 baud, 8 bits, 1 stop bit. Replace eth0 with the interface of your internet connection (if you’re using Wi-Fi, probably it’s wlan0). There should be 2 partitions on the SD card, a smaller FAT32 boot partition (bootfs) and a larger system partition (rootfs, with an ext3, ext4 or other filesystem). The boot partition has the MLO and u-boot.img files. Some U-Boot versions search for the kernel image in the boot partition, some just simply mount the system partition and search for the image in it’s /boot folder. Make sure there’s only one kernel image on the SD card, preferably in the /boot folder of the rootfs. Replace /dev/sde with the SD card device file. You’ll need bitbake (apt-get install bitbake). The latter command missed some packages for me, install those and proceed. After everything’s finished, you’ll have a rootfs and a bootfs in the build/tmp-angstrom_v2012_05-eglibc/deploy/images/beaglebone directory. Simply erase everything on the SD card and copy the contents of these two files to their partitions. You’ll need the TI Arago cross-compiler which is in the BeagleBone SDK. Download it from here (ti-sdk-am335x-evm-05.04.01.00-Linux-x86-Install). There are some useful development documentations here too. Copy the created uImage file to the SD card’s /boot directory (on the rootfs), and copy the modules to the rootfs’ /lib/modules directory. Click here for the Midnight Commander compiling howto. – Why is the kernel sources of RobertCNelson needed? here. How can I fix it? I’ve tried several kernel sources for the BeagleBone and I found that the RobertCNelson tree is a fairly latest source and easily compilable one. You have to use the command clone instead of checkout. Sorry for the mistake. when following the instructions above, the call of ./build_kernel.sh the compilation process starts. However, menu config is called. What did I wrong? How can I fix that? I think I forgot to mention to switch branches after downloading the kernel source from git. Sorry about that. I deleted the whole stuff and did as you have mentioned above. But there is still no am335x_evm_defconfig. The directory KERNEL is missing now…. What did I wrong? How can I fix it? gave spurious compilation errors at least on my system (AMD64). # this was the root of spurious compilation errors. # Have a lot of fun! Did the BeagleBone boot with your kernel? I had problems with the armv7a-unknown-linux-gnueabi- suite. Only the kernel compiled with the Arago compiler booted successfully. 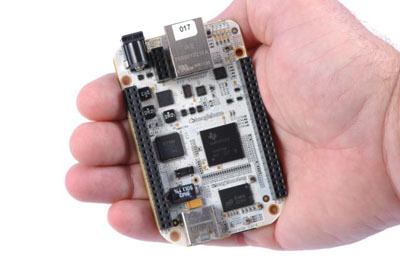 the Beaglebone arrives yesterday and yes, the kernel boots fine.